and coated in shredded coconut. Preheat the oven to 190C. Grease and line the base and sides of a 20cm square cake pan with baking paper. Fill a sink one-third full with water. Place eggs and sugar in the bowl of an electric mixer. Place bowl in sink and whisk for 2 minutes or until mixture is runny and slightly foamy. Remove from sink. Using an electric mixer, whisk on high speed for 4 minutes or until mixture is pale and triples in volume. Using a sieve, sift just enough flour to cover the top of the egg mixture. Using a large metal spoon, fold in flour in one light motion. Repeat sifting and folding with remaining flour until just combined. Combine vanilla and butter in a bowl, then add a large spoonful of batter and stir to combine. Gently fold the butter mixture into batter until just combined, then spoon into the prepared pan. On a work surface, spin the pan to level, then bake for 25 minutes or until centre springs bake when pressed with your fingertip. Cool in pan for 5 minutes, then turn out onto a wire rack to cool completely. Freeze for 20 minutes; this will make the sponge easier to cut. To make icing, stir butter and milk in a heatproof bowl over a saucepan of gently simmering water until butter is melted. Sift over sugar and cocoa, then stir until smooth. Turn off heat. My note - I didn't use the double-boiler method as described here to make the icing, I just put the ingredients in a saucepan and had the burner set very, very low. Using a large serrated knife, trim sides of sponge, then cut into 16 cubes. Scatter coconut over a tray. Insert a skewer into the crust side of a piece of sponge (don't go all the way through). Holding the skewer over icing, and, holding a spoon in the other hand, spoon icing over the sponge, rotating the skewer to coat evenly. 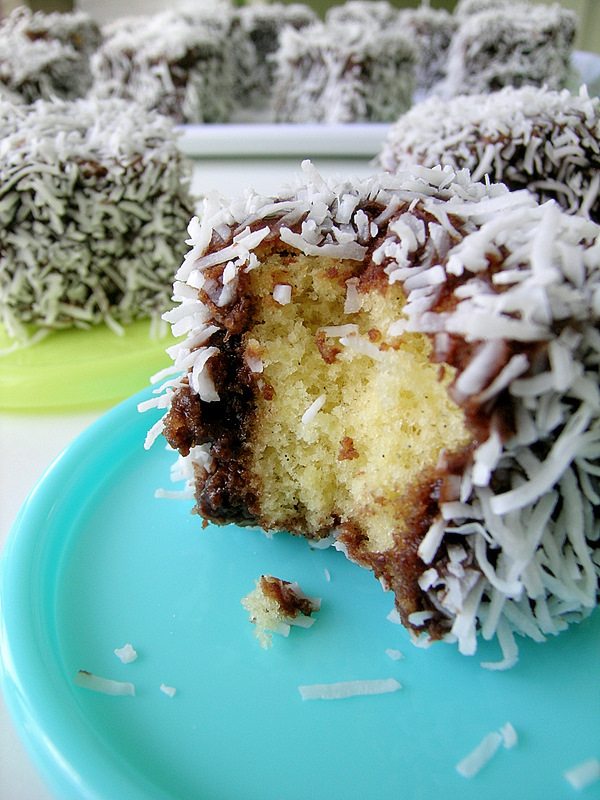 Shake off excess, then slide sponge off the skewer onto the tray of coconut. Scatter coconut over the top and sides of sponge, then transfer to a tray lined with baking paper. Repeat with remaining sponge cubes, icing and coconut. If the icing starts to thicken, stir in a little water to thin. My note - using a skewer was useless! I ended up just dropping the sponge cube into the icing, spooning icing over it, then using a fork to lift it out and sit it on the coconut.